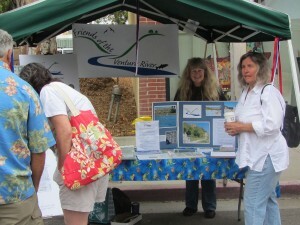 A steady stream of people came by the Friends of the Ventura River booth at the July 4th Street Fair to learn more about the Ventura River Parkway Plan. All were excited about the prospect of having such a wonderful resource accessible to the community for enjoyment and recreation. They were also pleased to hear about the goals of habitat restoration and improvement in water quality. They were impressed to learn that Friends has a National Park Service Rivers, Trails and Conservation Technical Assistance Grant to design trails on properties owned by the Ventura Hillsides Conservancy, the city, county and state. Older residents remembered the days when they could simply walk down to the river to swim and play in the water. The Parkway will restore the incredible Ventura River resource for all residents’ benefit. Many asked about how they could volunteer to help make the River Parkway a reality. Since Friends is a wide coalition of community, non-profit and governmental groups, prospective volunteers were directed to organizations which have ongoing volunteer efforts: Surfrider’s Ocean Friendly Gardens and the Ventura Hillsides Conservancy’s volunteer days. Ocean Friendly Gardens is focused on reducing urban runoff by creating natural gardens in place of lawns and trapping runoff water to nourish those gardens. Volunteers help implement these projects. The Conservancy has much work to do on properties that it now owns along the river, so all volunteers are welcome!